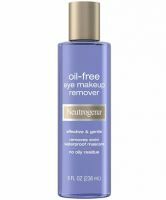 Yes, the makeup removers by Estèe Lauder and Lancome are wonderful, but so is Neutrogena's "Oil-Free Eye Makeup Remover" at a fantastic price--about $8.00! The totally non-oily liquid is activated when shaken. It removes even the most stubborn, waterproof makeup in the most gentle, refreshing way. I love it to take off the last of all-day cheek and lip stains as well. It's a great price, great product. Does a good job of removing eye makeup without making my skin break out, or causing problems with my contacts! I'm definitely going to continue buying this product.